It’s Salba day again in The Badlands! Salba is one of the best pool riders ever and even if he confesses in “Grosso Letters To Skateboarding” that Malba (lil’ bro) was once better than him, Salba has ripped more pools than anyone. Last May 18, 2011, TransWorld SKATEboarding announced Steve Alba as the recipient of the 2011 year’s Legend Award, an award that sets out to officially recognize, acknowledge, and honor those who have forever shifted the legacy of what it means to be a skateboarder. Salba just launched his own brand, Salba-Cruz, he was recently hosting the Upland Vert contest at … Upland and one of his protégé, Tristan Rennie just landed #3 at the Amateur Combi Pool Classic last Saturday. Stepping on a skateboard for the 1st time in 3rd grade, Steve Alba evolved to bigger and better boards throughout the 70's. Salba is the pioneer of backyard pool skating and has become one of the most talented and most consistent pool rider to emerge during skateboardings vertical period. Long gone the rivalry between Alva (the Dogtown Mad Dog) and the Albas from Salbalands. Salba won the world’s first-ever pool contest—held at Spring Valley during the historic Hester Series—in 1978 and hasn’t stepped off his board since. Having reportedly skated more backyard pools than anyone else alive, Salba has consistently placed in the top five at just about every contest he’s entered over the past 35 years he’s spent as a pro skateboarder, earning the nickname “Le Machine” as a result. 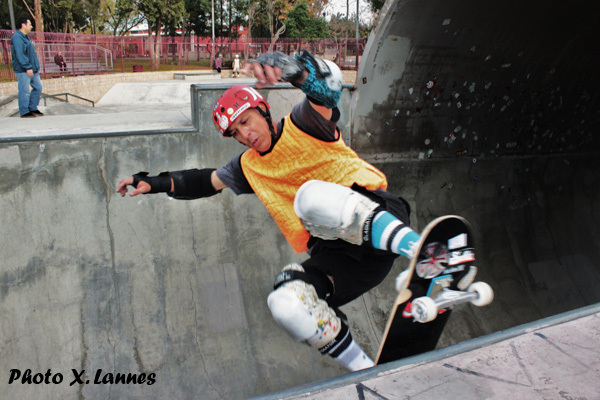 In between contests, Steve Alba focused on strength and endurance at places like the Central Pool, L-Pool, Baldy Pipe, and later the proving grounds of Pipeline skatepark in Upland—home to some of the finest vertical riders to have ever have skated such as Chris Miller and brother Micke Alba.